Content creators all know how difficult it can be to monetize your work. You have to contend with ad blockers and constantly fight stolen content. This can take up a lot of your time that should be spent actually creating things. To make matters worse popular creators on social media often receive no reward for the work they put into making quality content. A new cryptocurrency, Narrative, is hoping to provide a novel solution to this problem using blockchain Technology to build a new kind of social media platform. So, what is narrative and how is it trying to change the way we create content? The main purpose of Narrative is to democratize the way users are paid for the content they create. Rather than the bulk of the reward going to the Mark Zuckerbergs of this world it will instead be given to the influencers, moderators and creators who actually make the content. The main purpose of the narrative network is to reward all users who add value to the platform. Social media is one of the most valuable industries today and the likes of Facebook, Reddit and twitter all rely on users generating their own content. If we didn’t share things on Facebook or post on twitter they would be very quiet places indeed. The problem is that most of the users who generate content get nothing in return while the companies that own the platform get to reap all the rewards. There are already some solutions to these problems in the form of platforms like Patreon or Steemit but only a very small number of users even realize that their content might be worth something. Niche – The closest equivalent to a Niche is probably a sub-reddit. These are essentially topic boards that have owners and moderators that receive rewards for maintaining the Niche. Each Niche is designed to be unique and must be approved by the community before it can be placed on the network. Authors will be able to associate their content with up to three Niches. In order to maintain a niche owners must pay a yearly fee. Niches can be quite profitable so there is a strong monetary incentive to create one. Brands – Brand channels are essentially company portals. Brand owners get certain privileges, such as the ability to opt-out of ads and appoint moderators without a vote. In order to obtain those privileges they have to pay a premium and are not eligible for network rewards. Brands are also able to appoint editors who can review content before it is posted to their network. If a brand is deemed to be unfitting for the community it is possible for the tribunal to get rid of it. These three areas are all targeted at very different kinds of authors and require a robust ecosystem to ensure that they function. Rather than having the company control what content is published on the network everything goes through user elected Tribunals. This tribunal has final say on all matters relating to the content on the network. Additionally moderators are nominated by Niche owners and elected by the community. This helps to prevent abuse and any moderators who abuse their power can referred to the Tribunal. One of the most important aspects of the Narrative Network is transparency. Users will be able to see every action a moderator takes and will also be able to easily find out who owns any niche. It will also be possible for users to see what rewards an individual content creator has earned for their work, to ensure that everybody can see how the Network operates. How does user and content reputation work in Narrative? One of the most important aspects of the Narrative Network is the reputation feature. A user’s reputation influences everything from the power of their vote to whether they are eligible to receive content rewards, it essentially represents their standing in the community. A user’s rating is updated daily and is a combination of a number of factors; account age, average content rating, correlation with community votes (Do user votes on content generally match community votes on content) and activity points. A lifetime overview of each user’s rating is available for everyone to see. Another important aspect of the network is the content rating system. Every piece of content has a rating based on thumbs up and thumbs down and users with a higher reputation have more impact on the overall rating of a piece of content. Ongoing assessment by users is designed to promote some sort of community harmony. Another interesting feature of the Narrative Network is the ability to mark whether content is “kid friendly”. Any content not marked as such will be invisible to younger users. How do Narrative Network’s user rewards work? As part of the token sale a maximum of 100 million tokens will be issued to users with a total maximum of 197.5 million tokens issued over the lifetime. Once Narrative is fully rolled out new NRVE tokens will be minted and released directly into the Network Rewards fund over the next 30 years, with a maximum amount of 5 million per year for the first ten years. Users collect their reward during each payout period. During these periods a user’s total “credit balance” will be updated via their control panel. Rewards can be collected in either USD or NVRE but USD payments can take up to 14 days to process. Any USD payments are made through a third party provider like Facebook. If users opt to receive payment in NVRE tokens then they will receive payment instantly via a NEO transaction. Users can receive their rewards in a variety of ways. The bulk of the network rewards are given out to content creators. The top 90% of content is eligible for content creator rewards and users with a very low reputation score are not eligible. This is to prevent users from trying to game the system in order to obtain network rewards. 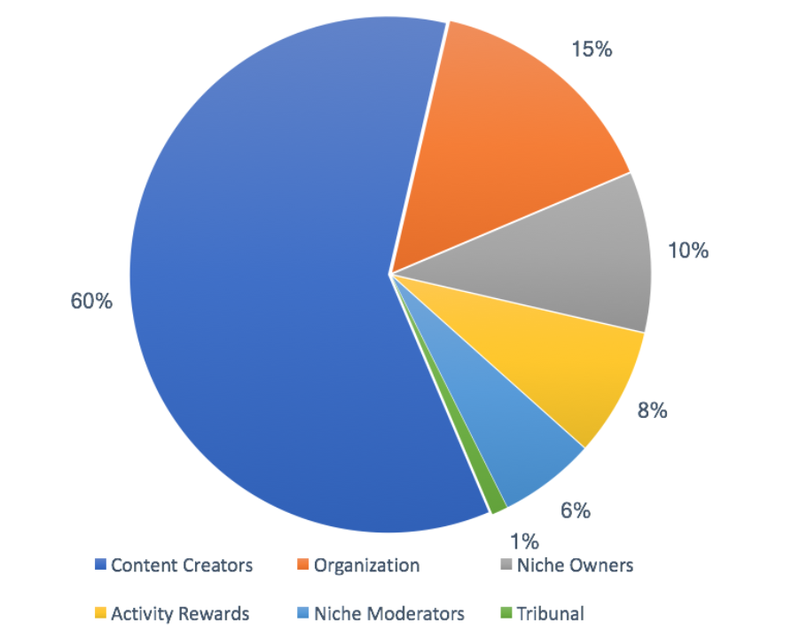 Niche owners and moderators are given a percentage of the content reward for all eligible content associated with their Niche. Each member is also eligible to receive an activity reward. Another way that users can earn money through content is via tips. Users are able to tip another user for any reason, be it for great content or a moderator who handled a difficult situation well. These tips serve as unofficial payments between users and act as an incentive to create good content even if you do not receive any network reward. Is NVRE a good investment? The Narrative Network represents an interesting investment opportunity even by blockchain standards. 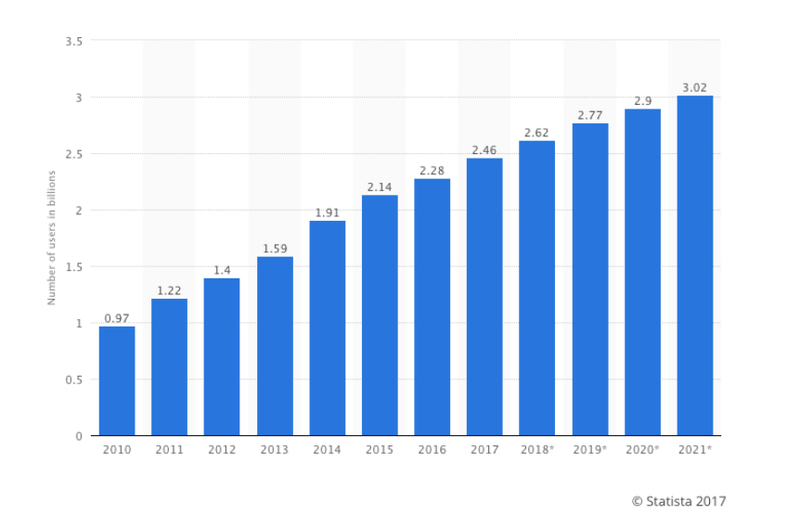 Their main target is the social media sector which is set to grow to $3.01 billion by 2021 but they are also targeting other industries such as the publishing industry, by removing the reliance on publishers for content creators. There are also existing examples that demonstrate that the Narrative network could flourish. The most relevant example is the blockchain powered social network Steemit. Like Steemit it allows users to directly receive rewards for any content they create but NVRE provides a lot more community control. Narrative is also far more accessible for crypto-phobic users because it gives the option to receive rewards in USD rather than NVRE. The Narrative Network also has access to more robust revenue streams including advertising. One interesting aspect of Narrative is that it is one of the early adopters of the NEO ICO platform. While ERC20 powers the majority of newer ICOs it has experienced significant slowdown over the last few months. NEO offers faster and cheaper transactions times and the network is arguably easier to scale than Ethereum. The key reason for shifting to NEO was actually the barrier to entry for creating a token sale. Currently it costs $25,000 to create a new token for NEO and this ensures that any projects that use NEO’s platform are serious. The Narrative token sale began on the 20th of February and will run for 30 days. Investors will receive 300 NVRE per NEO token that they invest. One important thing to note is that Narrative requires any investors to provide their identity in order to comply with know your customer and Anti money laundering legislation. NVRE represents a good long term choice for investors because of the nature of the network. It is likely that there will be a rush to claim popular niches and topics and investors who hold NVRE will either be able to cash in by selling their tokens to users who want to own a Niche or claiming the lucrative topics for themselves. Whether the Narrative Network has the ability to compete with the social media giants remains to be seen however their project is well thought out and does have a great deal of potential.